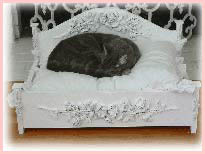 This beautiful bed is perfect for your chic lil' pet. It can hold a kitty or dog up to 40 pounds. 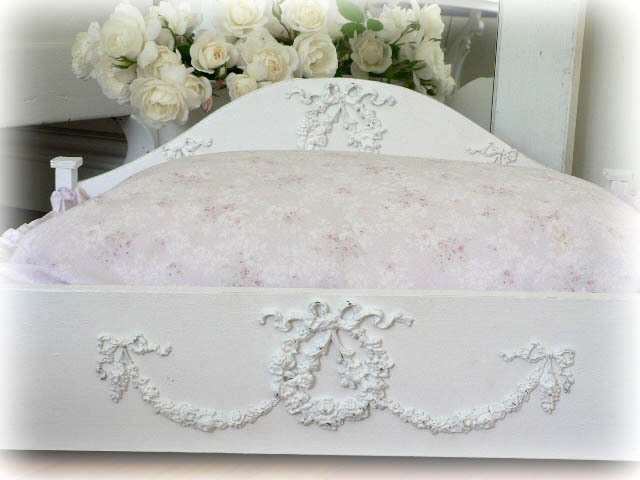 There are beautiful large wreaths and swags of roses with ribbons on both the headboard and footboard and rose drop appliques on each of the front legs. 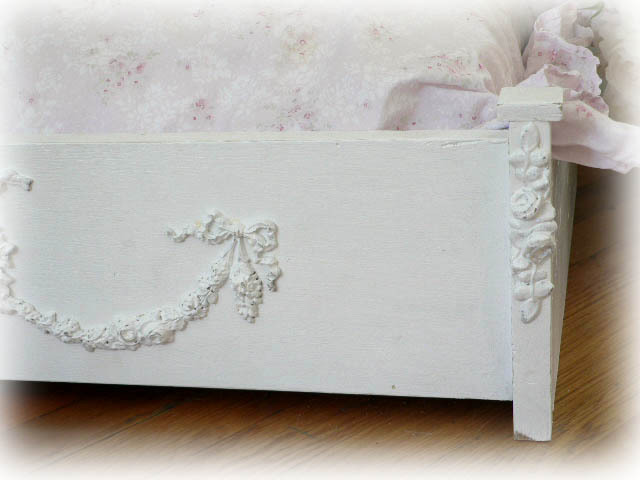 This bed is handcrafted from solid wood, hand painted white and slightly distressed. 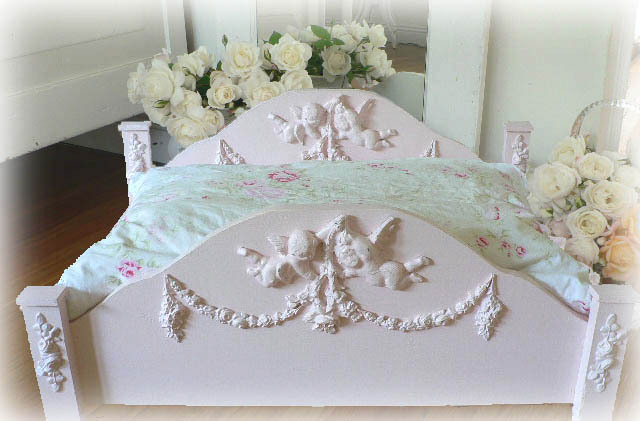 The curved headboard measures 11.75" high and the straight footboard measures 6.25" high. The bed measures 27.25" wide x 18.5". 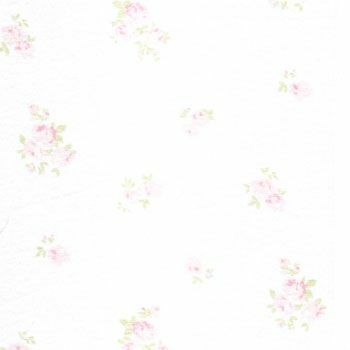 The interior measurements are 25.25" wide x 16.75", and can hold a standard size pillow. Pillow and Ruffled white sham can be purchased seperately for an additional charge. This beautiful bed is perfect for your chic lil' pet. It can hold a kitty or dog up to 40 pounds. 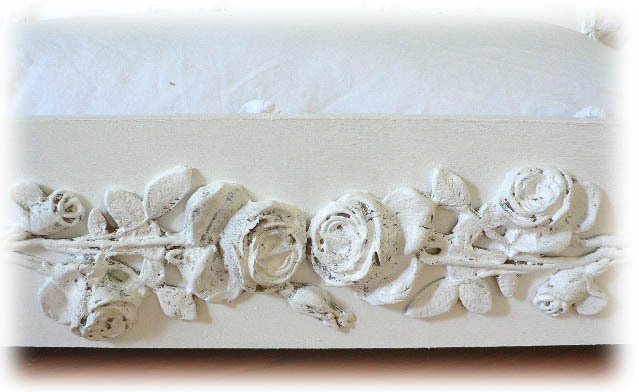 There are beautiful swags of roses with ribbons on both the headboard and footboard and rose drop appliques on each of the front legs. 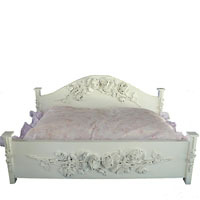 This bed is handcrafted from solid wood, hand painted white and slightly distressed. 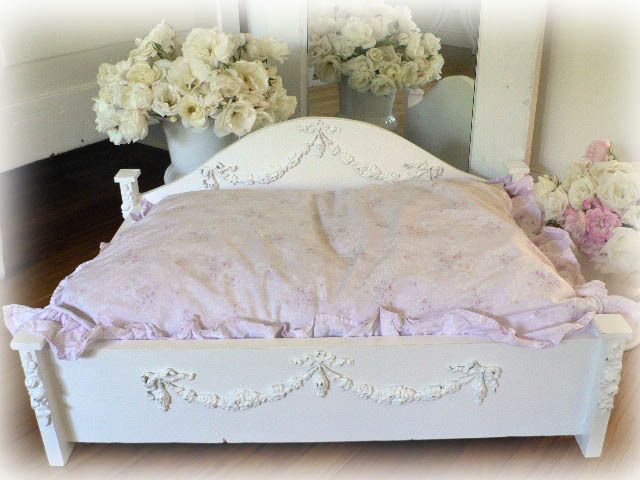 The curved headboard measures 11.75" high and the straight footboard measures 6.25" high. The bed measures 25.5" wide x 18.5". The interior measurements are 23.5" wide x 16.75", and can hold a standard size pillow. 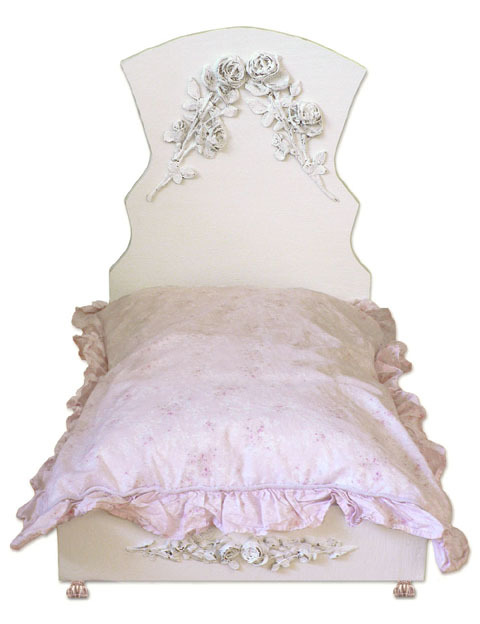 Pillow and Ruffled white sham can be purchased seperately for an additional charge. 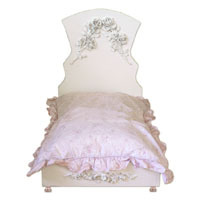 This beautiful bed is perfect for your chic lil' pet. It can hold a kitty or dog up to 40 pounds. 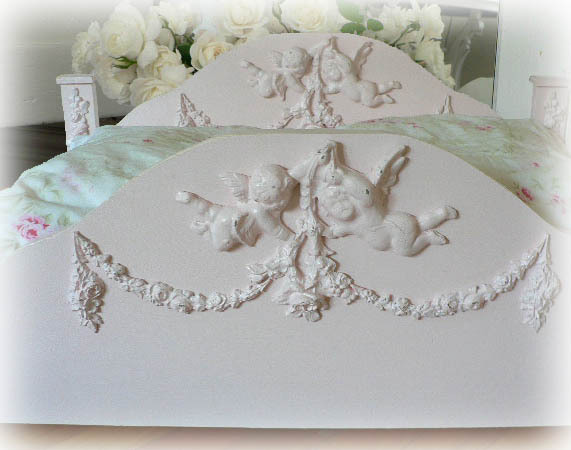 There are beautiful large cherubs and swags of roses with ribbons on both the headboard and footboard and rose drop appliques on each of the legs. 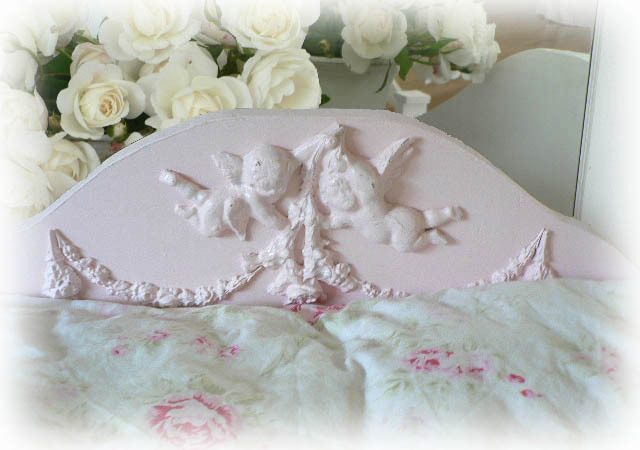 This bed is handcrafted from solid wood, hand painted pink and slightly distressed. 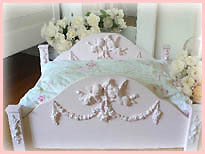 The curved headboard measures 11.75" high and the curved footboard measures 10" high. The bed measures 27.25" wide x 18.5". The interior measurements are 23.25" wide x 15.75", and can hold a standard size pillow. Pillow and Ruffled white sham can be purchased seperately for an additional charge. 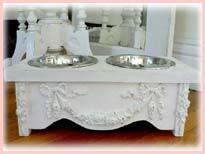 This beautiful bed is perfect for your chic lil' pet. It can hold a kitty or dog up to 40 pounds. 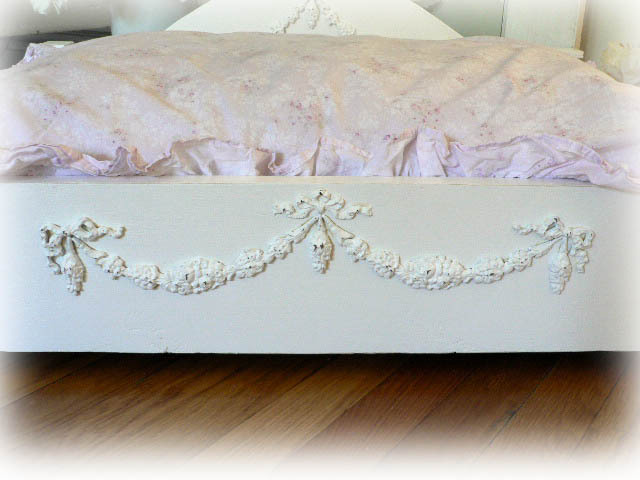 There are beautiful thick swags of roses on both the headboard and footboard and long rose drop appliques on each of the front legs. 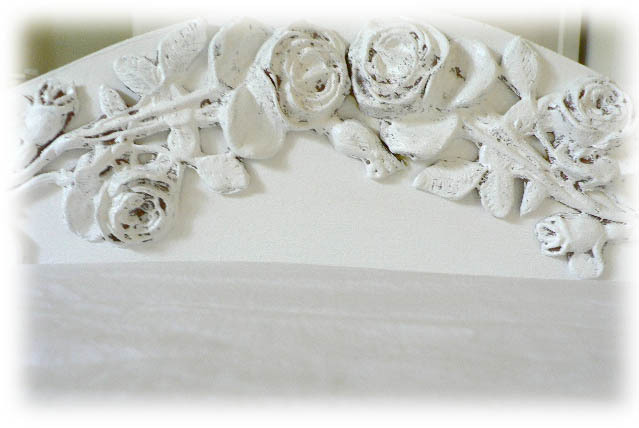 This bed is handcrafted from solid wood, hand painted white and slightly distressed. 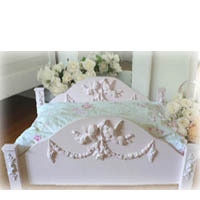 The curved headboard measures 11.75" high and the straight footboard measures 6.25" high. The bed measures 27.25" wide x 18.5". The interior measurements are 25.25" wide x 16.75", and can hold a standard size pillow. Pillow and Ruffled white sham can be purchased seperately for an additional charge. This beautiful bed is perfect for your chic lil' pet. It can hold a kitty or dog up to 40 pounds. 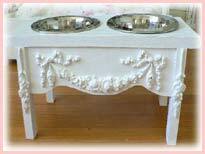 There are beautiful thick swags of roses on both the headboard and footboard, and 4 large clear glass knobs for feet. 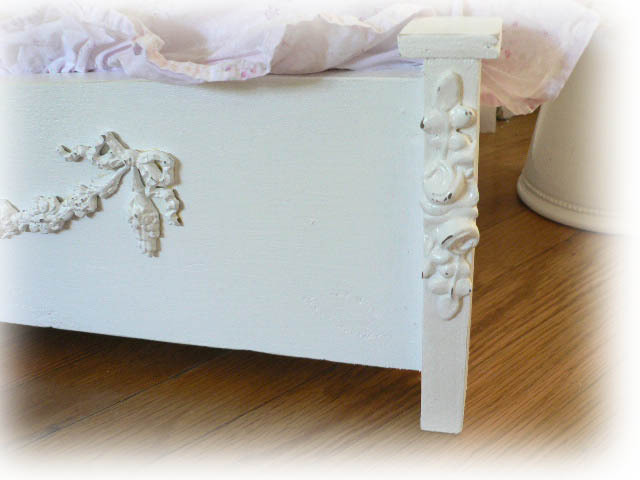 This bed is handcrafted from solid wood, hand painted white and slightly distressed. 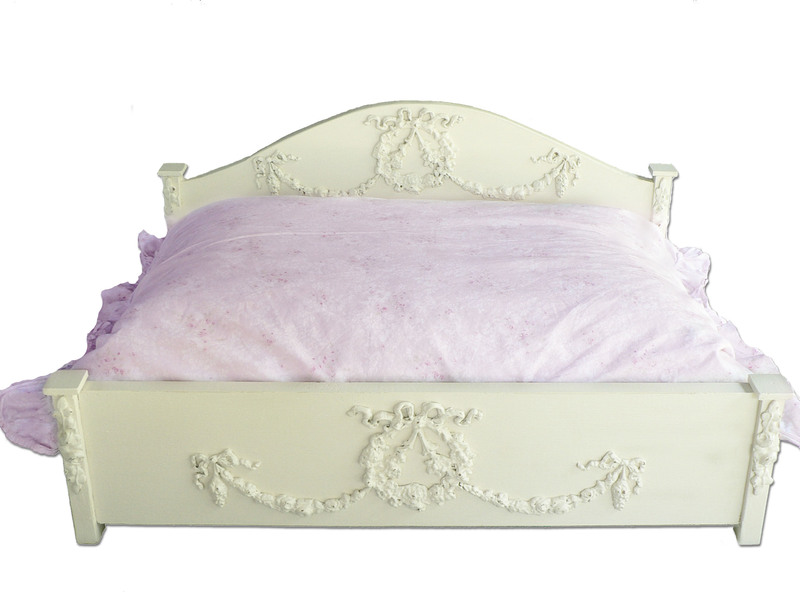 The tall, curvy headboard measures 27" high and the straight footboard measures 6.25" high. The bed measures 18" wide x 27". 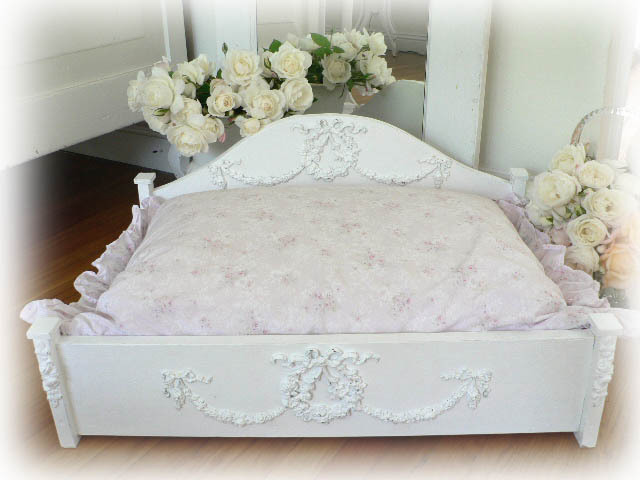 The interior measurements are 17" wide x 25", and can hold a standard size pillow. 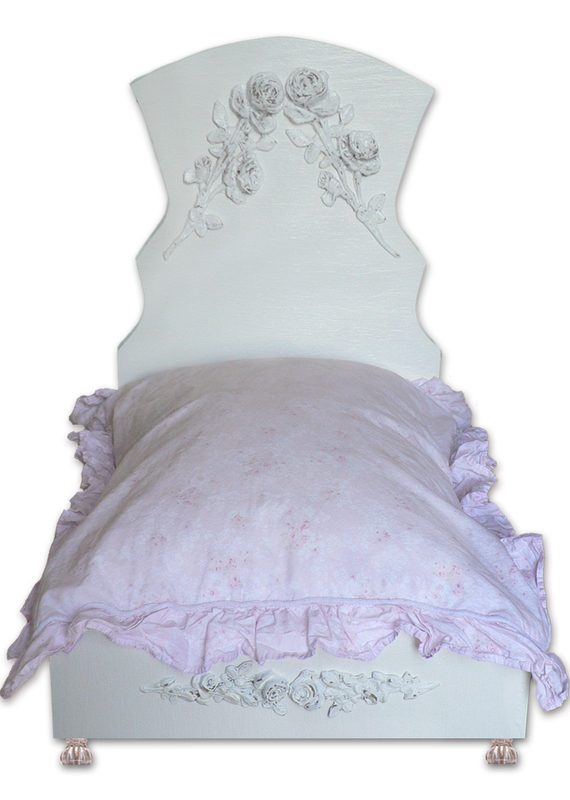 Pillow and Ruffled white sham can be purchased seperately for an additional charge.